In this research zooplankton distribution of UzunçayÄ±r Dam Lake were determined between March 2010 - February 2011. Zooplankton samples were taken regularly in each month from the dam lake. pH, dissolved oxygen and water temperature values were recorded in situ by us-ing portative equipments. In the dam lake 23 zooplankton species were recorded. All of these species 15 species from Rotifera, 6 species from Cladocera and 2 species from Copepoda were identified. The most attractive species were from Rotifera because of its species richness and number of individuals. Especially in spring months zooplankton were recorded in highest indi-vidual numbers and species. Numbers of species diversities were determined high in May (12 species). The study has got an importance as to be the first research on zooplankton in UzunçayÄ±r Dam Lake. In Lake Ecosystem, zooplankton occupy the second trophic level of food chain and are im-portant food source for invertebrates and fishes. In addition, they act as indicator of water quality, eutrophication and the level of water pollution (Sharma, 1983; Saksena, 1987; Berzins and Pe-jler, 1987). A lot of work has been carried out on the zooplankton fauna of Turkey Ozdemir and Sen (1994), Saler and Sen (2002) Bekleyen (2003), Saler (2004, 2009), Kaya and Altindag (2007), Saler and Sen (2010); Saler et al (2011). However, the zooplankton fauna of Uzunçayir Dam Lake has not been studied before. The pre-sent study was therefore conducted to determine the zooplankton composition in Uzunçayir Dam Lake. Uzunçayir Dam Lake is located on Munzur River at the southeastern of Tunceli. Dam Lake was built to produce electric and also fishing was made in dam reservior. 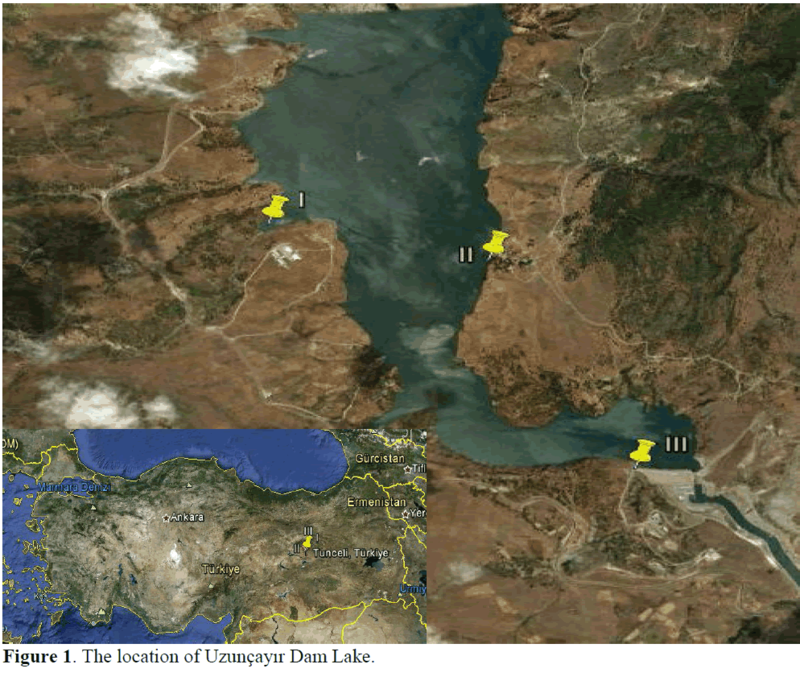 In this research zooplankton distribution of Uzunçayir Dam Lake were determined between March 2010 - February 2011. The zooplankton samples were collected with a standart plankton net (Hydrobios Kiel, 25 cm diameter 55 μm mesh size) horizontal hauls from three stations (Station I 39o09.59"N, 39o30'2.53"; Station II, 38o59'59.56"N, 39o31'1.43''E and station III, 38o58'59.19''K, 39o31'41.06''E) and the specimens were preserved in 4% formaldehyde solution in 100ml plastic bottles.The map of research field was given in Figure 1. The species were identified according to Kolisko (Edmondson, 1959; Grasse (1965); Kolisko, 1974; Koste, 1978 a, b; Dumont ve De Ridder 1987). Temperature and dissolved oxygen were measured by an Oxi 315i/SET oxy-gen-meter, pH by a Lamotte (pH 5-WC) model pHmeter. Figure 1: The location of Uzunçayir Dam Lake. In Uzunçayir Dam Lake 15 species of Rotif-era, 6 species of Cladocera and 2 species of Co-pepoda were identified and given below. 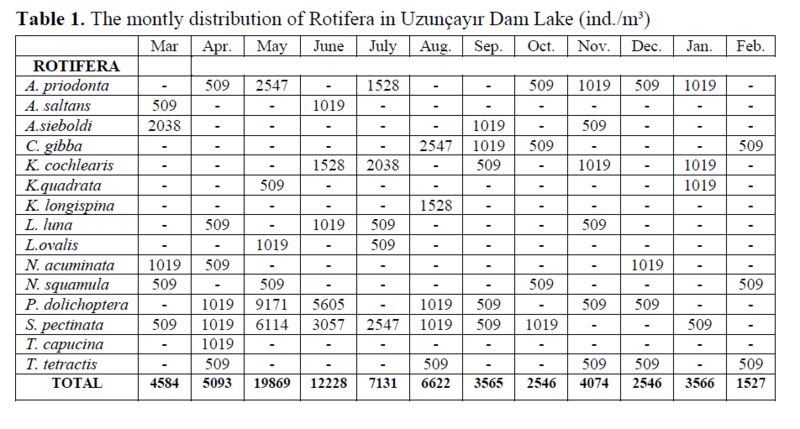 The montly distribution of Rotifera, Cladocera and Copepoda are given in Uzunçayir Dam Lake (Table 1 and 2). Total Montly distribution of zo-oplankton fauna is shown in Uzunçayir Dam Lake (Table 3). S.pectinata the most abundant species was ob-served for 9 months during the study period and showed its peak May with 6114 ind./m³ while the lowest were recorded in March, September and January with 509 ind./ m³. The second most dom-inant species was P. dolichoptera, which occured in 7 monts. The highest number of this species was recorded in May with 9171 ind./m³, and the lowest in September, November and December with 509 ind.m³. Cyclops vicinus, the Copepoda group was ob-served for 8 months during the study period. In addition the total zooplankton individual was showed that maximum (5604 ind/m³) in June. The recorded species than Cladocera group were not demonstrate permanent distribution. Ceriodaphnia reticulata was recorded during for 4 months. Simocephalus vetulus was recorded in only September. In Uzunçayir Dam Lake, the highest water temperature was found as 20.1°C in August. In January, the lowest water temperature was rec-orded as 7.1 °C. In March, the highest value of dissolved oxygen was recorded as 10.1 mg/L. In November, the lowest dissolved oxygen value were recorded 4.6 mg/L. pH value was changed between 6.8 and 8.1. Temperature, dissolved ox-ygen and pH values of the Uzunçayir Dam Lake were recorded in the field and shown in the Table 4. Rotifers are regarded as bioindicators of water quality (Sladecek, 1983; Saksena, 1987) and high rotifer density has been reported to be a charac-teristic of eutrophic lakes (Sendacz, 1984). In eutrophic lakes, permanent dominant rotifer species have been reported, such as Brachionus and Keratella (Tanyolac, 1993). In Uzunçayir Dam Lake, the Rotifera group was more domi-nant than the other two groups. 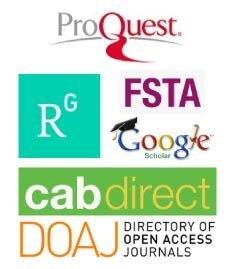 According Segers (2007), all the recorded ro-tifer species in the present study are widely dis-tributed around the world. Also many of the rec-orded species are common in Turkey (Kaya and Altindag, 2007; Kaya et al., 2007). Only six spe-cies of Cladocera were observed in Uzunçayir Dam Lake. Among them B.longirostris and C.sphaeriscus are cosmopolitan species (Buyur-gan et al., 2010). The ecological features of the recorded species show that most of them are cosmopolitan and littoral inhabiting (Kolisko, 1974). Additionally, among the recorded species, B. longirostris and C. vicinus, P. dolichoptera, K.cochlearis are well known indicators of eu-trophy (Ryding and Rast, 1989; Haberman, 1998). D. longispina, and C. sphaericus, of the Cladocera group, were dominant in the lake; however, these species are generally found in eu-trophic lakes (Berzins and Bertilson, 1989). All of these species were recorded in the dam lake. Saler and Haykir (2011) reported there was a marked decrease in total zooplankton species richness and individual number in winter and a sharp increase in spring and summer months in Pulumur Stream. Similar results have been re-ported in this study. Saler (2011), reported 11 zooplankton species from Munzur River. Uzunçayir Dam Lake was built on Munzur River and in the dam lake 23 zooplankton species were identified. Saksena (1987), mentioned Rotifers as the dominant zooplankton in in freshwater ecosys-tems. In Uzunçayir Dam Lake Rotifers were found in every season. Saler et al. (2000), in Euphrates River, Saler and Sen (2001), in Zikkim Stream emphasized that, rotifers were observed maximum numbers in spring. Zooplanktonik organisms have been rec-orded in high individual numbers over the period of the spring in the present study. Güher and Erdogan (2005), have reported spring and summer rotifer maksimums from Gala Lake. In Kesikköprü Dam Lake Yigit (2006), ob-served rotifers in greater number in spring and autumn than in other seasons. Seasonal distribu-tion of rotifer fauna of Uzunçayir Dam Lake is shown an agreement with the findings of Güher and Erdogan (2005). Rotifer species belonging to the family Bra-chionidae species that were observed in Gumuldur Stream by Ustaoglu et al. (1996) have showed similarities to that recorded in Uzunçayir Dam Lake. Ipek and Saler (2008), found rotifers as the most abundant species in spring period in Seli Stream. They emphasized Brachionidae species of rotifers as the most observed family as in Uz-unçayir Dam Lake. pH is significantly effective on distribution of zooplankton in terms of zooplankton density Limit pH value for zooplankton is reported as 8.5 (Berzins and Pejler, 1987). Dam lake pH value ranged within normal limits. The zooplankton of Uzunçayir Dam Lake consist mainly of Cladocera, Copepoda and Ro-tifera groups. Uzunçayir Dam Lake 23 zooplank-ton species were recorded. Dam Lake were rep-resented with 15 Rotifers species. Rotifera showed higher diversity compared to other groups, reaching also high densities throughout the study period. This study is supported by Firat University Scientific Research Project (FÜBAP) under Pro-ject No. 2006. Bekleyen, A., (2003). A Taxonomical study on the Zooplankton of Göksu Dam Lake (Diyarba-kir), Turkish Journal of Zoology, 27: 95-100. Ipek, N., Saler, S., (2008). Seli Çayi (Elazig-Türkiye) Rotifer Faunasi ve Bazi Biyoçesitli-lik Indeksleri Ile Analizi, Ege Üniversitesi Su Ürünleri Dergisi, 25(3): 211-215. Kaya M., Altindag, A., (2007). Zooplankton Fauna and Seasonal changes of Gelingülü Dam Lake (Yozgat, Turkey), Turkish Journal of Zoolo-gy, 31: 347-351. Kolisko W.R., (1974). Planktonic Rotifers Biology and Taxonomy Biological Station. Lunz of The Austrian Academy of Science, Stuttgart. Koste, W., (1978a). Die Radertiere Mitteleuropas I. Textband, Berlin. Koste, W., (978b) Die Radertiere Mitteleuropas II. Tofelband, Berlin. Özdemir, Y., Sen D., (1994).Haringet Çayinda Saptanan Zooplankter Organizmalar, Firat Üniversitesi Fen ve Mühendislik Bilimleri Dergisi, 6(2): 136-140. Ryding, S.O., Rast, W. (1989). The Control of Eutrophicayion of Lakes and Reservoirs, Man Biosphere Series, Parthenon Publica-tion Group, Vol 1, USA. Saler (Emiroglu), S., Sen, B., Sen, D., (2000). Fi-rat Nehri Kömürhan Bölgesi Rotiferleri ve Mevsimsel Degisimleri, Su Ürünleri Sem-pozyumu, Sinop, 385-396. Saler, S., (2004). Observations on the Seasonal Variation of Rotifera Fauna of Keban Dam Lake Çemisgezek Region, Firat Üniversitesi Fen ve Mühendislik Bilimleri Dergisi, 16(4): 695-701. Saler, S., (2009). Rotifers of Kepektas Dam Lake, (Elazig-Turkey), Iranian Journal of Science and Technology, Transaction A 33(A1): 121-126. Saler, S., Sen, B., (2010).Long term changes in rotifera fauna of Guluskur Bay of Keban Dam Lake, (Elazig-Turkey), Journal of An-imal and Veterinary Advances, 9: 1909-1912.Bekleyen, A., (2003). A Taxonomical study on the Zooplankton of Göksu Dam Lake (Diyarba-kir), Turkish Journal of Zoology, 27: 95-100. Saler, S., Eroglu, M., Haykir, H., (2011). 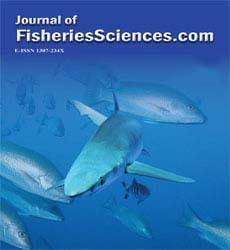 Peri Çayi (Tunceli-Türkiye) Zooplanktonu, e-Journal of New World Sciences Academy, 6(2): 14-20. Segers, H., (2007). Annotated checlist of the rotifers (Phylum rotifera), with notes on nomenclature, taxonomy and distribution, Zootaxa, 1564: 1-104. Tanyolac, J. (1993). Limnoloji Ders Kitabi. Hati-boglu Yayinlari. 249. Ustaoglu M.R, Balik S, Aygen C., Özdemir, D., (1996). Gümüldür Deresinin (Izmir) Rotifer Faunasi, Su Ürünleri Dergisi 13(1-2): 163-169.